This was taken in the Loves Hotel in Broompark, not sure when but certainly in the early fifties. 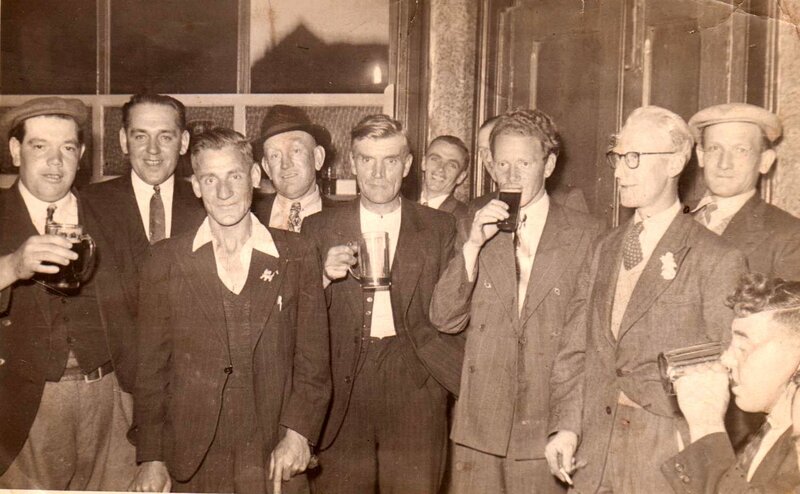 Pat Fehily is second from the left, Pat Neary is third from the right standing up, drinking. I would be guessing if I gave other names – I think Mr Clark is on there and Mr Burlison. Others will know I hope. I have no idea why the photo was taken but the Loves was where all the men went and we kids used to go to the hatch that opened at the end of the bar and try to catch our dad’s eye to get crisps bought for us. It usually worked. First Holy Communion service at St. Josephs, around the mid 50’s. 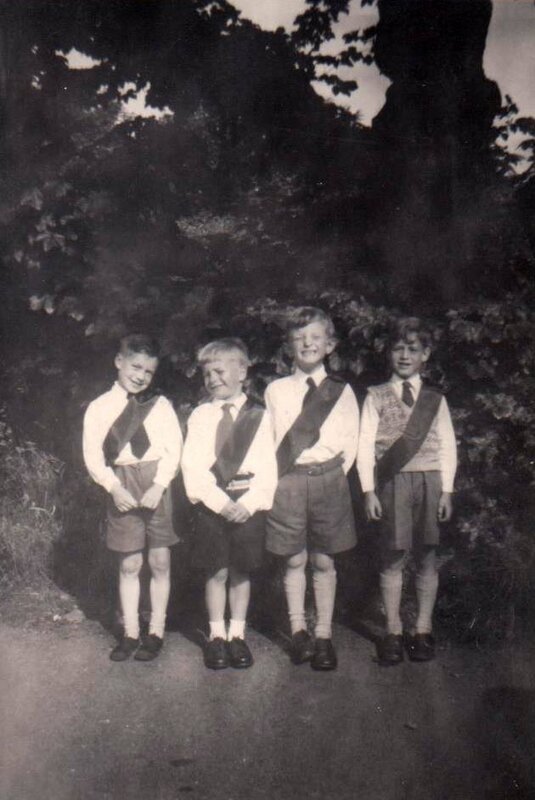 left to right…Dennis Campbell, unknown, Bryan Fehily, Ronny Nightingale.. 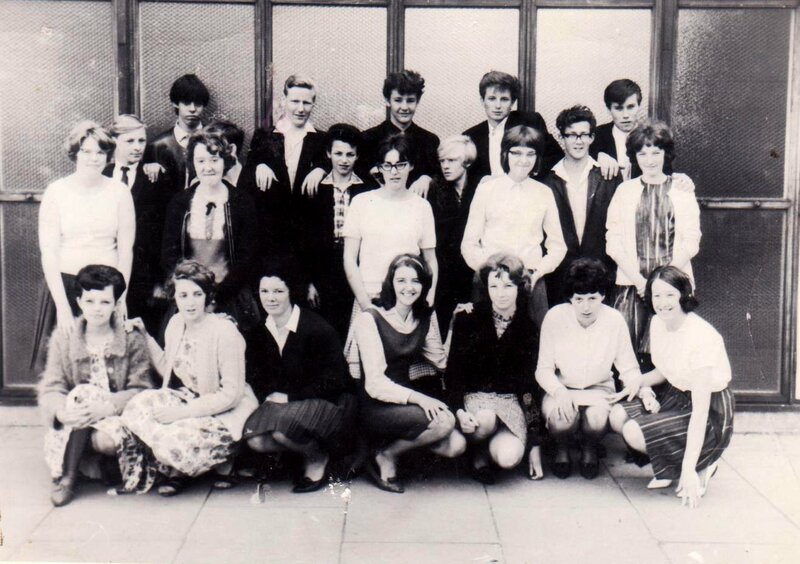 This was my class at the secondary modern school in Ushaw Moor, and was taken June 24th 1964.
the class had been bigger than this but I am guessing others left as soon as the exams were over while this group hung around a bit longer. I think that in general we had been sorry to be leaving.. Those in this class was from several of the surrounding villages. back row: Billy Jones, Ian Bailey, Kenny Rowlinson, Ian Maguire, Jim Grossert. next row: ? ,?, David Hepburn, Andrew Rome, Trevor Nancarrow. next row: Judith Rudge, Avril Storey, Kathleen Holmes, Joan Mountain, Patsy Fehily. front row: Ann Stoddart, Elsa Fleming, Jean Thorpe, Carole Sewell, Marion Carr, Catherine Rowan, Marjorie Skillcorn. others were Colin Gott, Keith Newman, Colin Hindmarsh, Derek Toase, Joan Cowan, Barbara Hutton, Rod Buchanan. I dont know what happened to most of the class and sadly not all are still with us. However I do still talk to and see Ann Stoddart regularly. I hope those who check the Blog are interested to see these.